Most people don’t have the money to hire a trainer or pay for expensive gym memberships. Instead, they opt to purchase fitness equipment like the CycleOps SuperMagneto Pro Trainer instead. 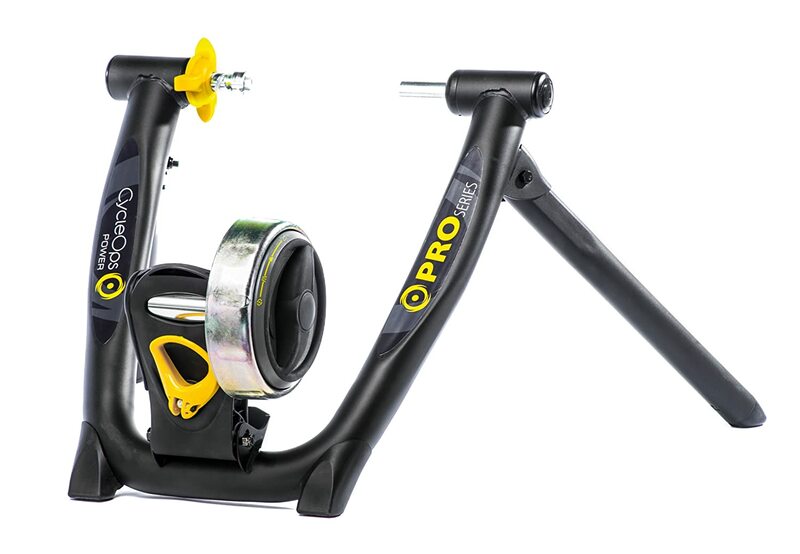 This indoor bike trainer currently costs $419.99 on Amazon. Made in the USA, this magnetic trainer utilizes Flexible Power Curve technology and PowerTuned technology. Its resistance unit happens to be progress magnetic and it has a total of four resistance levels. The roller size is approximately two inches and the rear hub spacing is about 130 to 135 millimeters. As soon as you open the package, you’ll come across the very first advantage of this product. Like other trainers in the Pro Series, this magnetic trainer comes already completely assembled. Along with the actual bike trainer, there will be a training DVD and steel rear skewer inside the box. According to the manufacturer, there are four rare magnets inside this bike trainer. As your pedaling speed increases, the magnets will move away from the flywheel’s center. In other words, these four magnets are what enables the resistance to up as if the bike were a fluid trainer. This bike has four adjustment levels: Easy, Road, Interval, and Mountain. Obviously, the Mountain adjustment level is the most difficult one. The Easy mode is best for warming up, the Road mode mimics road conditions, the Interval mode introduces sharp contrasts in resistance, and the Mountain mode stimulates riding in a World Cup course. No matter the level, you always start at a resistance of zero. However, as time goes by, the resistance will increase at a rate that varies by level. With this magnetic trainer, you’re rarely going to have to change the settings during a ride, if ever. The resistance of this fitness equipment is very progressive, while other trainers like it tend to have a very steep curve for each and every ride. Most customers have found that the SuperMagneto Pro is very quiet, especially for a trainer of this type. If you spend about $35 to purchase the trainer-specific tire, this trainer will become even less noisy. In terms of the feel, this trainer is often described as very smooth and road-like. A final advantage of this bike trainer is that it is foldable. If your household happens to be short on space for whatever reason, this may be the ideal piece of fitness equipment for you. As soon as your finished exercising on the SuperMagneto Pro, you can just fold it up and store it against a wall or inside a closet. Also, when you need to use it again, unfolding it is just as easy. One thing many people complain about when it comes to this bike is that it is not always very sturdy. Even though the bike is completely secure in the trainer, the system does have some flex. Therefore, when you pedal, the bike will sway side-to-side. This is especially true if you push the unit by standing and putting in true power. While this may be more realistic, this aspect could be very disconcerting, particularly if you’re used to trainers that are dead-solid. The main thing that will discourage people from buying this bike trainer is the price. No matter how you look at it, this trainer is not even close to being cheap. This alone will weed out plenty of potential customers. There are simply too many bike trainers out there on the market that go for much, much cheaper than this piece of fitness equipment. However, that is not to say that this bike trainer isn’t worth the money. It is quite the contrary, actually. Overall, the SuperMagneto Pro Trainer is an excellent magnetic bike trainer. It has many benefits, such as progress resistance, a total of four resistance levels, the fact that it can fold, and how quiet and road-like it is. While the price tag of this product is rather high, when you consider everything this bike trainer offers, you could actually consider it a steal. If the SuperMagneto is out of your budget, you might consider a similar yet less cost intensive offering like the Mag Trainer or the Fluid 2 from CycleOps.